The ASUS Transformer Pad TF701T comes in a single box (unlike some other hybrid devices of the company) and only has the essential accessories. The wonderful news is the dock/keyboard is part of the standard bundle. You'll find an AC adapter as well, and a detachable cable ending on a proprietary 36-pin connector. The usual documentation is there too but no headphones to speak of, or any other accessories like a carrying sleeve for example. Now, we're pushing it really, about that last bit. The ASUS Transformer Pad itself doesn't seem to have been changed at all compared to its predecessor - the Transformer Pad Infinity 700 - at least visually. Internally, it's a whole different story, which we're going to deal with later on. 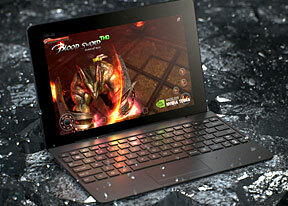 At 263 x 180.8 x 8.9 mm, the Transformer Pad is 0.5mm thicker than the model it replaces. Not that this is a deal breaker, in fact it's not even noticeable. ASUS has managed to make the Transformer Pad lighter than the outgoing model by 13 grams (585 vs. 598g), which is hardly a difference you can feel in real life. And since the competition hasn't been sitting still, the Transformer Pad is notably heavier and thicker than the Samsung Galaxy Note 10.1 2014 edition and the Sony Xperia Tablet Z, not to mention the iPad Air. Asus went for Gorilla Glass 2 as their protection of choice for the gorgeous 10.1" IGZO IPS display. It's not as tough as the latest generation Gorilla Glass 3, but it's nice to know that scratches and light damage aren't not on the Transformer Pad's list of fears. The screen bezels are fairly generous, which isn't such a bad thing after all, considering you'll need as good a grip as possible on a slate of 10-inch diagonal. However, we found that the front gets really messy after some usage, as there's no oleophobic coating to prevent this from happening. The back of the tablet is immune to this as it is made of aluminum and is really nice to both hold and look at. It's a brushed aluminum finish which is further accented by the company's trademark spun metal finish and the ASUS logo sitting proudly in the middle. Aluminum at the back allows for even heat dissipation. Another benefit of using aluminum is that the Transformer Pad feels extremely solid. There's no squeaking, bending or twisting even when using the tablet with one hand. But the ASUS Transformer Pad isn't picture perfect. It's the bottom of the device that gets most of our gripes. There, we find holes for docking with the keyboard station, which are fairly large and easily collect dust. Not to mention the ASUS 36-pin proprietary port used for charging and data transfers. These are small caveats though that can't take away from the Transformer Pad being a handsome tablet with plenty of personality. Above the big 10.1" screen of the slate is a 1.2MP front-facing camera that can record 1080p video @ 30 fps, just like the main camera. All physical controls and ports of the Transformer Pad are located on its sides. The Power/Lock is in the top left corner, in landscape. It has a tiny LED, which gets lit when the tablet is being charged. The volume rocker is located on the short side, just off the power key. Below it is the microSD card slot, as well as the microHDMI port and the 3.5mm headphone jack. The bottom features a 36-pin proprietary ASUS connector in the middle, a hinge hole on either side to attach the keyboard dock. On the right side you'll also find the mic that picks up the audio when recording video. Other than this, the right side is blank.